The oldest registered breed of cattle is the Highland. It was first documented in 1884, but one would think they were around much earlier than that. Perhaps the breed doesn't stretch as far back as the Iron Age, so let's just say my herder pictured above is a Dark Age Scot. I do have some models appropriate to the Iron Age Celtic Shorthorn breed. For a future post I think I might sculpt a little ard (like a plough) pulled by a pair of cattle. All of the models are from Gripping Beast Miniatures. The herder is one of their Celtic warriors, minus the shield. Prehistoric rock carvings from Denmark show herders carrying spears. That seems prudent when considering the prevalence of wolves, bears, and cattle thieves. I first saw Highland Cattle on trip to Scotland in '99. There was a stuffed bull head hanging on the wall of the place where we staying. Some of my fellow American travelers had no idea what it was, thinking it looked like a prehistoric beast. I said it was a cow, but do one believed me until we later saw some grazing in a field. Back in October of '08 we went to pumpkin patch here in Colorado. The farm has a little Highland heard. 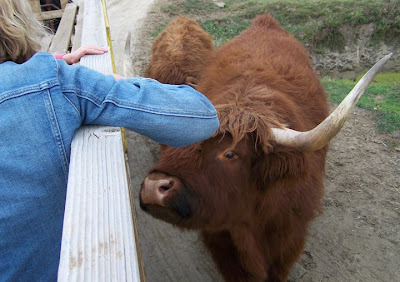 That's my wife petting the cow from the safety of our hay wagon. Very nice. 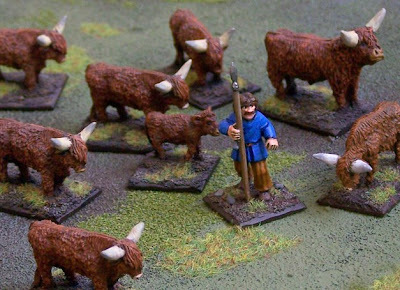 Watch out for those Border reivers though, all that beef on the hoof might start to attract some attention! I suggest you get them inside your wicker fences or even better, build some stone walls instead. Well, I can't say I blame those reivers. The beef is tasty. But, I think my cattle are safe. My wooly mammoth is fierce enough to protect them from harm, and he blends right in with the rest of the shaggy herd. Commonly known as "Wookiee Cows" among my friends and I, growing up.